The world of technology, digital marketing and social media has a significant impact on how we behave socially, act as consumers and how we do business. It could be correct to say that any business that does not adapt to the new era of marketing and communications is in danger of losing out to its competitors. Digital Marketing provides for a level playing field. Any business nowadays can compete with any competitor regardless of size with a digital marketing strategy. Traditionally a small retailer would struggle to match its larger competitors, who already are way ahead. A business can develop its online marketing strategy for very little cost and can potentially replace costly advertising channels such as television, radio and magazines. Unlike traditional methods one can see in real time what is or is not, working for your business. Being online you can adapt very quickly to improve and improvise. For measuring traffic volumes to website, one can use tools like Google Analytics to measure specific goals one wants to achieve. Blogs and email marketing solutions provide great insights into consumer behavior i.e. how many people are opening, reading and converting from your emailers, so there is a reality check instantly. 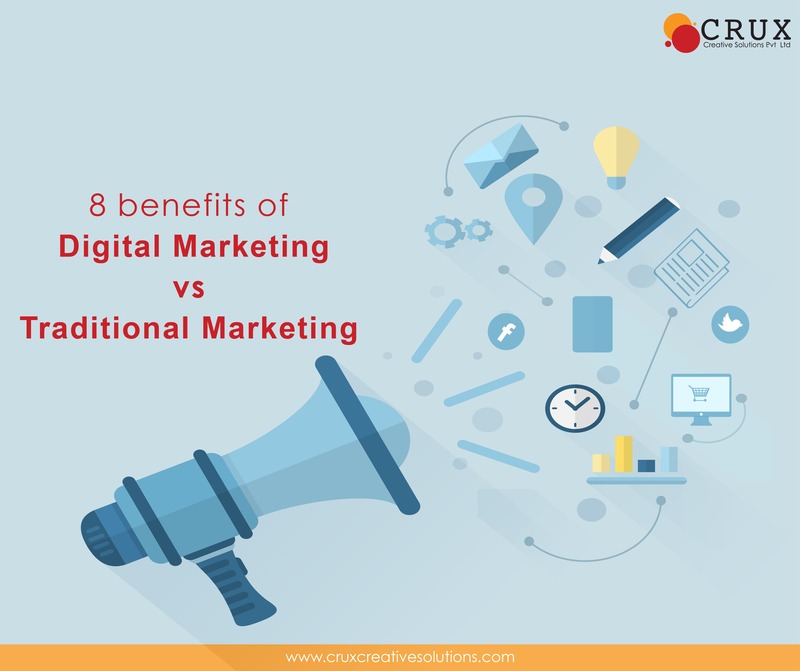 Digital Marketing provides real time results, one doesn’t have to wait weeks for a boost to business, unlike Traditional Marketing which is more like, waiting for a fax or a form to be returned. You can see and analyze the number of visitors to your website and analyze key elements such as its subscribers, peak trading times, conversion rates and much more, just at the touch of a button. This helps you in making amendments to your strategy very quickly. Digital Marketing helps in refinement of your strategy. Basically anything that you capture in your customer journey can be reported on and honed for greater success at the fraction cost of traditional marketing. Marketing online enables to refine your strategy at any point in time and see any improvements or opportunities for further refinement almost instantaneously a feature that Traditional marketing lacks. Being online is brand development. A well maintained website with quality content, that targets the needs and adds value to your target audience, can provide significant lead generation opportunities. The same can be said for utilizing social media channels and personalized email marketing messages. Whereas in Traditional Marketing one has to wait for an advertisement from a creative agency and then pay up to stream them on conventional media and then wait for the results to come, and not to mention that you can’t change your strategy mid-way. Online gives your business far greater exposure. A business can be seen anywhere in the world from one marketing campaign, the cost to do this using traditional methods would be considerable. Plus, once you have optimized the key word search content in your website you should see a long-term return on your investment and will be fairly low cost to maintain your ranking. Using social media share buttons on websites, emails and social media channels enables your message to be shared incredibly quickly. Digital Marketing is not Intrusive. Most people do not appreciate receiving sales mailshots or phone calls at inconvenient times or of stuff that they have little interest in. Through concentrated Digital Marketing campaigns, people get the choice to opt in or out of communications. Also, through concentrated and highly customized emails on topics that interests and adds value to you, one has the option and leisure to see it at a later stage, when one has time. Digital Marketing offers greater engagement. With digital marketing one can encourage your prospects, clients and followers to take action, visit your website, read about your products and services, rate them, buy them and provide feedback which is visible to your market/target audience. So it doesn’t take long for good publicity to enhance the prospects of your business and adds multiple new customers due to feel good factor of current customers. The world has transitioned from the traditional into a very digital environment. Even magazines are going digital, we perform many of our daily tasks, such as banking online, shopping and even much of our reading is done on e-readers. Because of the rise of the digital age, it just seems like common sense to invest in a digital campaign that will get your business more eyeballs. Even though traditional marketing still has a place, it is slowly, diminishing in our digitally based world. For businesses, it is imperative to have a website and use the web as a means to interact with consumer base. There are some successful traditional marketing strategies, particularly if you are reaching a largely local audience, but it is important to take advantage of digital marketing so as to keep up in today’s world.